The British government is building more prisons to lock up more people in the most incarcerated country in Europe. In the next few weeks a new mega prison, HMP Berwyn, in north Wales, will open its gates and the Ministry of Justice will start the process of filling this new mega prison with prisoners from across the country. Once fully operational it will hold more than 2,000 people, making it the largest prison in the UK. If the government gets its way, this will just be the start, with more prisons are on their way. 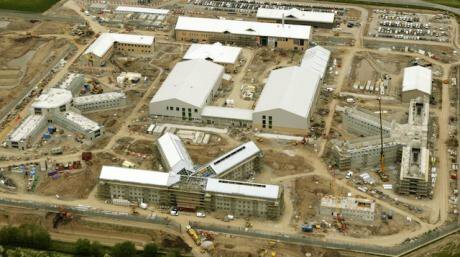 As part of the government’s £1.3bn ‘prison building revolution’, the Ministry of Justice are closing existing prisons with the intention of selling the land to fund new prison builds – either on existing sites, such as at HMPs Wellingborough and Glen Parva – or on new sites. Prisons have always been places of trauma and violence but during 2016, there were dramatic increases in assaults, self-harm and suicide. Self-inflicted deaths rose by 32% with a prisoner taking their own life every three days. The pressures building up in the prison system resulted in an outpouring of anguish and distress from prisoners – directed at themselves in the form of self-harm and suicide – and then outward at the system in the form of resistance and widespread rioting. This crisis was a long time in the making and the causes have been debated at length. The official line from government for some time was that rising mental distress and violence were down to an influx of psychoactive substances. This was nothing more than a diversion from the underlying pressures building up caused by the central contradiction at the heart of government policy. While ministers have been keen to slash prison budgets, staffing and resources, they have failed to cut prisoner numbers and close prisons. The prison-building programme is part of a broader public sector ‘reform’ agenda, with asset-stripping and privatisation at its heart. In the case of prisons, this involves the withdrawal of resources from services, and the sell-off of state assets and public land. This is supplemented by deregulation – a bonfire of red-tape and rules, the introduction of ‘league tables’ and placing the burden of imposing austerity on individual prison governors, under the guise of giving them greater ‘autonomy’. The white paper Prison, Safety and Reform, sets this out, but what is most striking is the commitment to build 10,000 new prison places. This is the equivalent of five more HMP Berwyn’s and has been subject to much less political debate and media attention. This pursuit of more prisons, more walls and more detention is something that must be challenged. In December, two former home secretaries and a former deputy prime minister called for a near halving of the numbers in prison, from 85,000 to 45,000. The implication of doing this would be to cease any prison building programme. However, rather than commit to stemming the flow of people coming into prisons, the government is pursuing a path of prison expansion. A letter published last week in The Guardian (26/01/17) offered an important challenge to the government’s position that the solution to the current prisons crisis is to build more prisons. With a long list of signatories including professional bodies, practitioners, campaigners, charities and academics, the statement calls for an immediate halt to the government’s prison building programme. Arguing that prisons do very little to address the needs of people experiencing harm and violence, it suggests that the £1.3bn allocated for new prison builds could be more wisely invested in community and social welfare provision. The Centre for Crime and Justice Studies were one of the signatories to this letter. Much of our work has sought to improve the day to day workings of the criminal justice system – to help people survive and move on with their lives. However, we are always mindful of the limitations of penal reform and the need to look beyond criminal justice. We believe that the United Kingdom’s over reliance on policing, prosecution and punishment is socially harmful, economically wasteful, and prevents us from tackling social problems. We want to see a radical downsizing of the criminal justice system and the growth and strengthening of alternatives and solutions that respond to people’s needs. This is about shrinking the institutional footprint occupied by the prison system – and building new prisons is anathema to this. Prisons have historically held a disproportionate number of people in poverty, in mental distress, the homeless and black and minority ethnic people. Over recent years, these inequalities have become more pronounced and building more prisons will simply result in more of the same. Rather than being places of justice, prisons are monuments to social injustice. They expose a woeful lack of imagination and ambition to take seriously the harms we all face in society. To do so would involve looking far beyond the prison walls to building the social and economic infrastructure that meets people’s needs and shields them from harm. Such a vision is both practical and possible, and ultimately doable.